Rain's Embellishments: Awesome New Handbag! AWESOME Alice in Wonderland handbag! Debi is an amazing seamstress! This is my third bag made by her... the other two being my Harry Potter bags that she made matching ones for both Amanda & I for the release of the last two books! 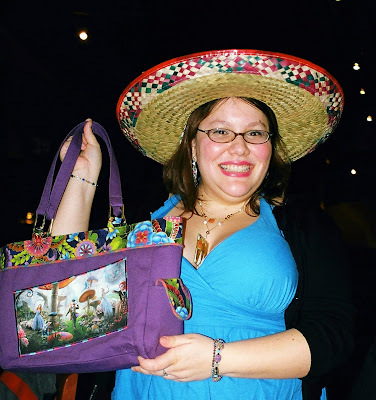 Here I am donning my Chevy's birthday sombrero after opening my present. Backside detail of the different characters from the upcoming movie. Inside ... it looks like a garden ... not quite the talking garden! She even zig-zagged the print using three different colored threads! I love it! I've been using it ever since I got it! Thank you soooo much Debi & Amanda! You ladies ROCK!!! Please visit my Etsy shop! "It can always be worse." Indie Sacramento - March vendors announced! I want to go to Bonnaroo!